I love potatoes, whether they are baked, fried, boiled, steamed, stewed or grilled – all are my favourite! 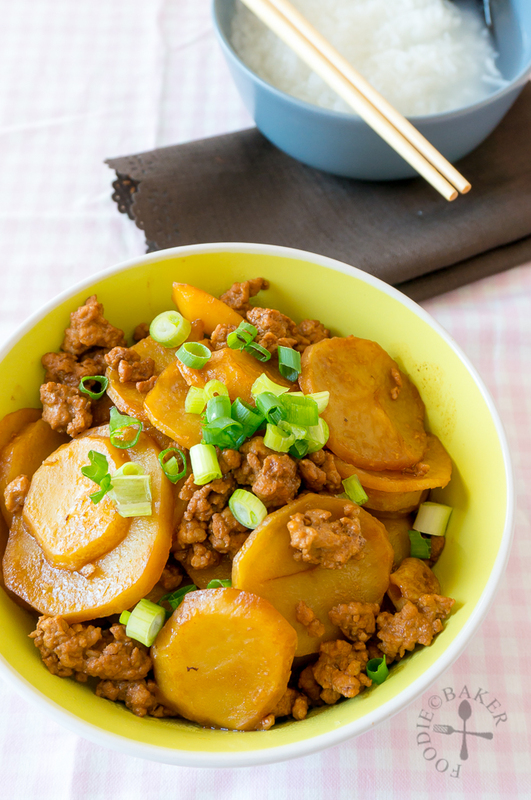 This particular dish is one that my mom prepares often – it’s a very quick and easy potato stew with minced pork that can be made in less than 30 minutes. 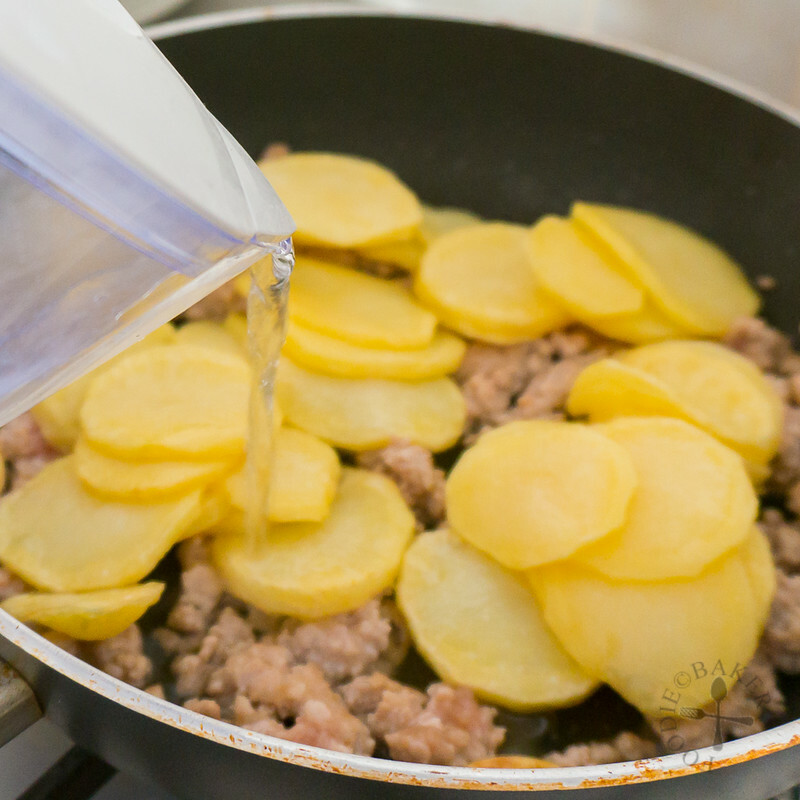 When I was younger, I would drizzle the salty and slightly starchy dark sauce over my rice or porridge, pile on the potatoes and minced pork and ate it all up with gusto – double the carbohydrates, double the comfort! As I grow older, I left out the rice and eat it on its own as I’m watching my weight. And now that I’m thousands of miles away from my mom, I have to make this comfort food by myself, which I guess it’s a good thing, otherwise this recipe won’t appear on the blog so soon heh. P.S. This is a scheduled post as I’m currently away in Denmark for holiday! So my apologies in advance as I won’t be able to visit your blogs and reply to your comments promptly until I’m back next week. Follow me on Instagram (@foodiebaker) or Facebook page to see what I’m up to there! My mom prefers using waxy potatoes instead of starchy ones because of its texture and its ability to hold its shape and stay firm after the frying and stewing. I’ve tried with both waxy and starchy ones and found that starchy potatoes indeed tend to break apart easily towards the end (especially if I’m too violent with the stew). But other than that, I felt that both types of potatoes taste equally good, so I guess it’s a matter of personal preference. I’m not sure why my mom fry the potato slices in oil before stewing, but I’m guessing it’s to partially cook the potato and to allow the exterior to firm up so that it doesn’t break apart so easily. My mom likes to keep the seasoning simple, so there’s no oyster sauce or other fanciful sauces, just simple seasoning that can be found in all Chinese families’ pantries. I remember she didn’t even use sesame oil to marinate the pork, but since I love the taste of sesame oil, I added a little bit into the dish. And as we all know, there is no such thing as detailed recipes for parents and grandparents. They’ve been cooking for so long that they no longer need this thing called tablespoon – they simply splash in a bit of this and dollop in a bit of that. So after a few attempts and play around with the seasoning, here is my best replica of my mom’s potato and minced pork stew! 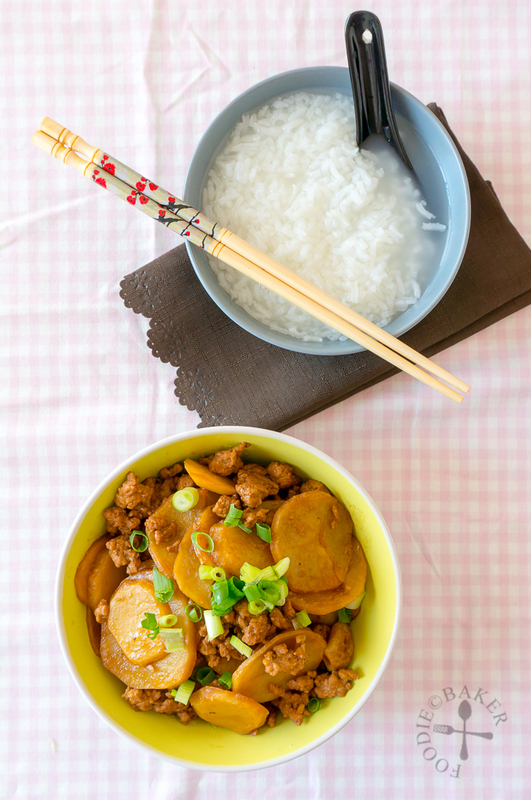 1) Marinate minced pork with light soy sauce, sesame oil and white pepper. 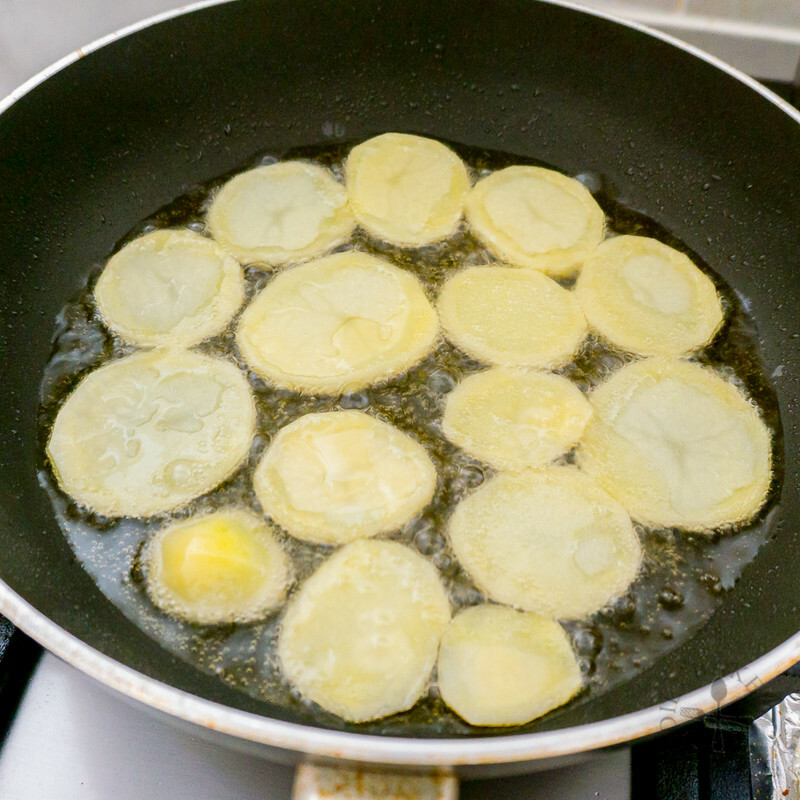 2) Fry the potato slices in oil until lightly golden-brown on the edges. Drain the potatoes. 3) Drain off all the oil and add back 1 to 2 tablespoons of oil. Add in garlic and fry until garlic is lightly browned. 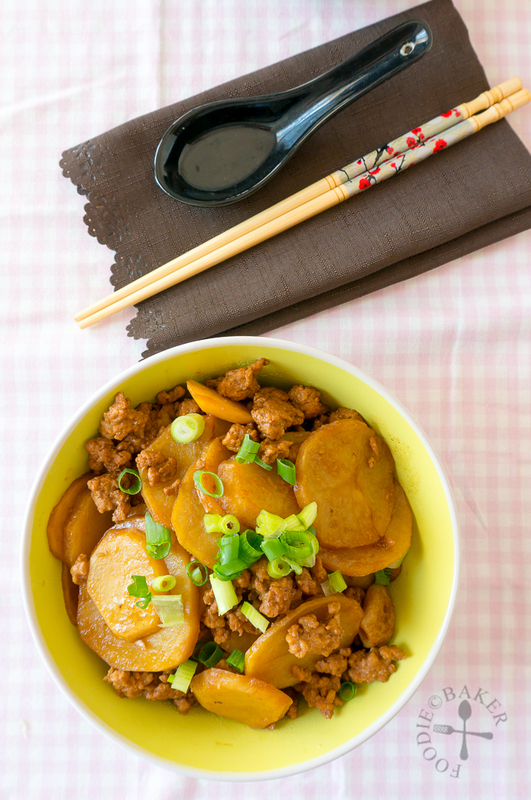 4) Add in minced pork and fry until the pork is no longer pink in colour. 5) Add in the potato. 6) Followed by water. 7) And dark soy sauce. 8) Simmer until the potato slices have softened. Garnish with spirng onion and serve! Peel the potato and slice into ¼-inch thick slices. Dry both sides of the potato slices thoroughly with paper towel. 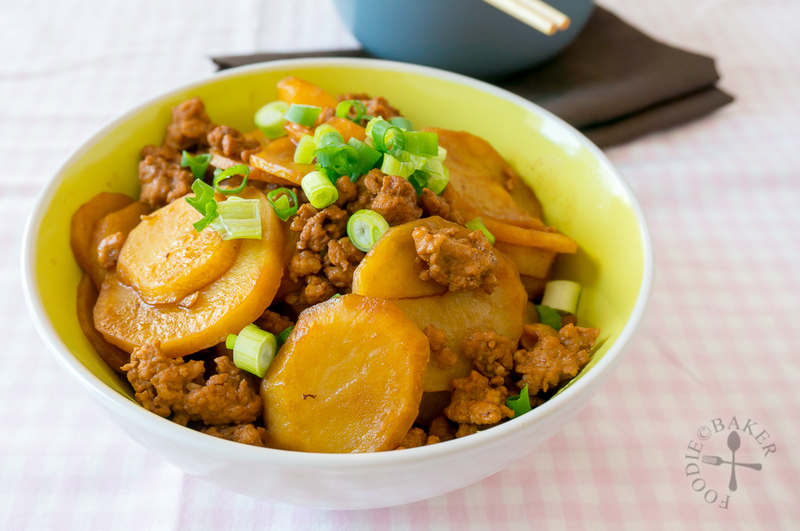 Mix minced pork, light soy sauce, sesame oil and white pepper in a small bowl. Set aside to marinate. Heat ½- to ¾-inch deep of oil in a large frying pan over medium heat until hot but not smoking. 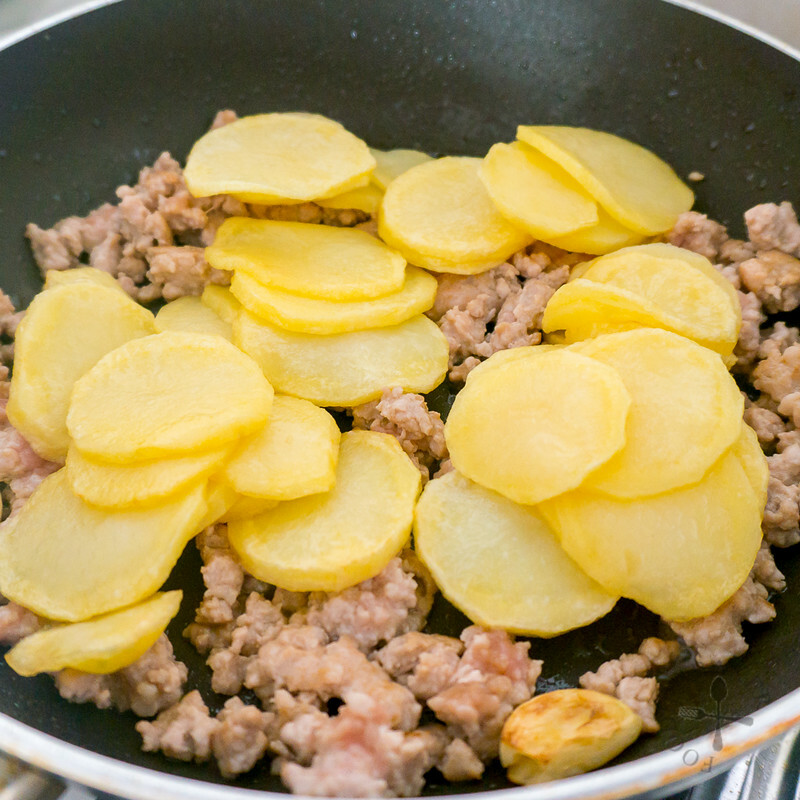 Add in the potato slices in a single layer and fry, flipping the potato slices, until both the edges are slightly golden. Drain the potatoes. Repeat until all the potato slices have been fried. 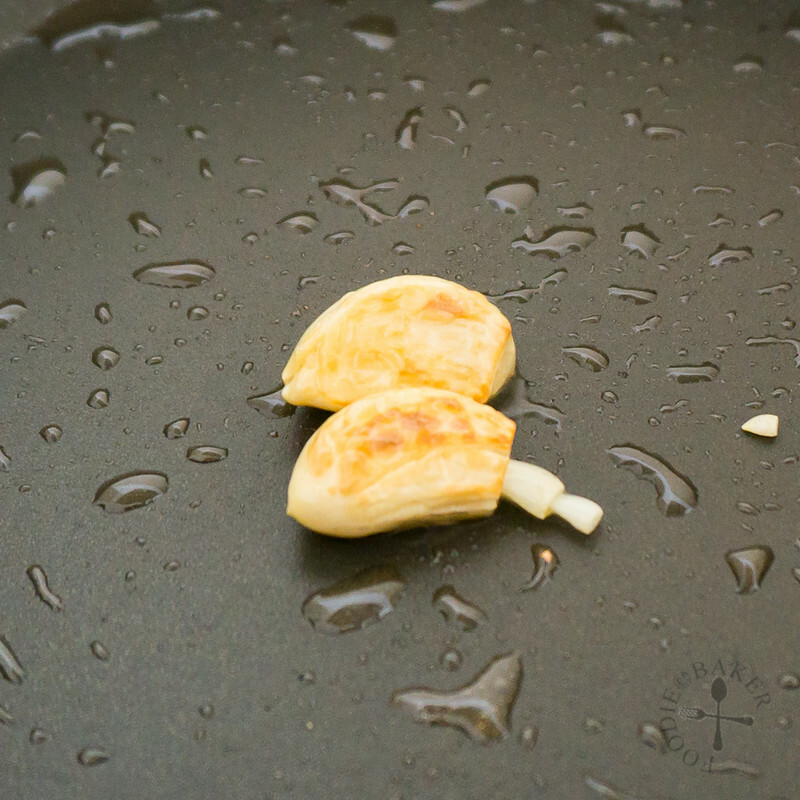 Drain all the oil in the frying pan until about 1 to 2 tablespoons of oil is left. Heat over medium heat and add in the garlic. 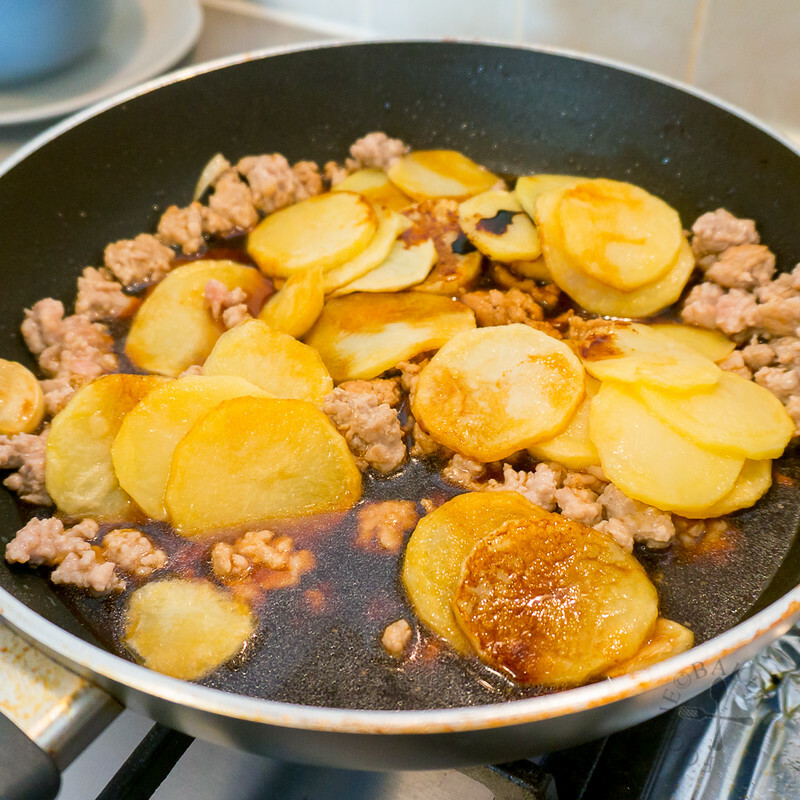 Fry the garlic until slightly golden and add in the marinated minced pork, flattening it into a single layer. Cook, untouched, for a few minutes until slightly browned then break up the pork and cook until the pork is no longer pink. Add in the potato slices, dark soy sauce and water. Bring to a boil then turn down the heat to a simmer. Cover and simmer for about 5 to 7 minutes until the potatoes are soft and the sauce is slightly thickened. If it's too dry, splash in a little more water. 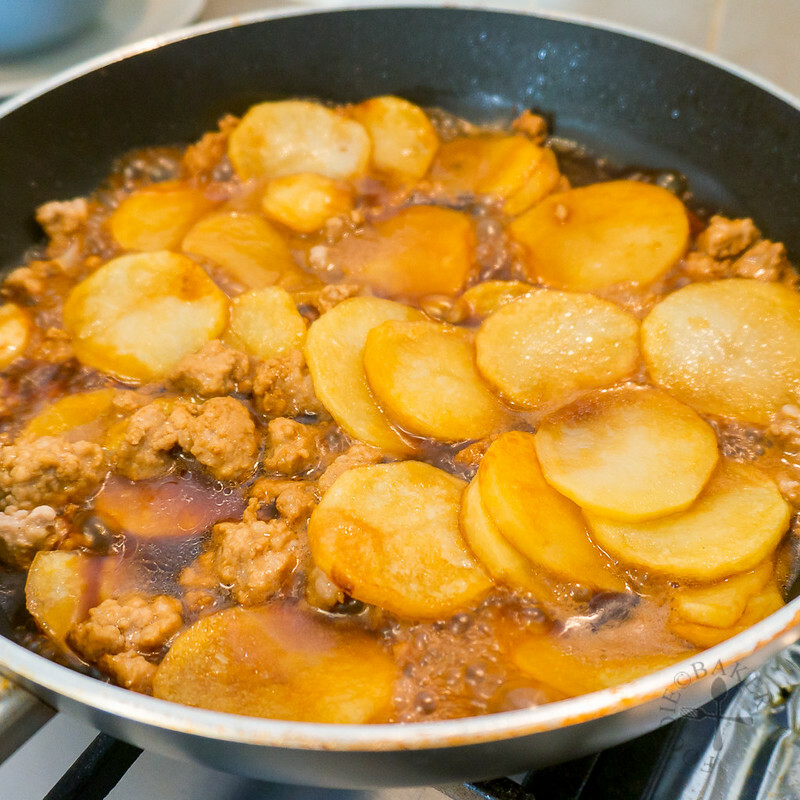 Transfer the potatoes into a serving plate, garnish with chopped spring onion and serve with porridge or rice. I am going to try to make this tonight. My grandmother used to cook this for the whole household way back when. I missed this and hope my kid will like this too. Thank you for sharing this recipe. Hi Kristy, I do hope you and your kid will like it, this is one of my top favourite dishes! You are welcome Gillian! I’m so happy you like it! Fantastic! My 2 years old daughter like it, including her dad! 🙂 thanks for the recipe! Thanks Mrs Dahlgren, I’m so happy your family like it! Just made this for tea tonight and it was delicious. Hubbie is on his second helping. Thank you for sharing your mum’s recipe. Easy to make dishes are the best. This stew looks delish. And I love potatoes too! I had tried this recipe out last Sunday. Really yummy. :..) Thank you for sharing. This go well with rice! 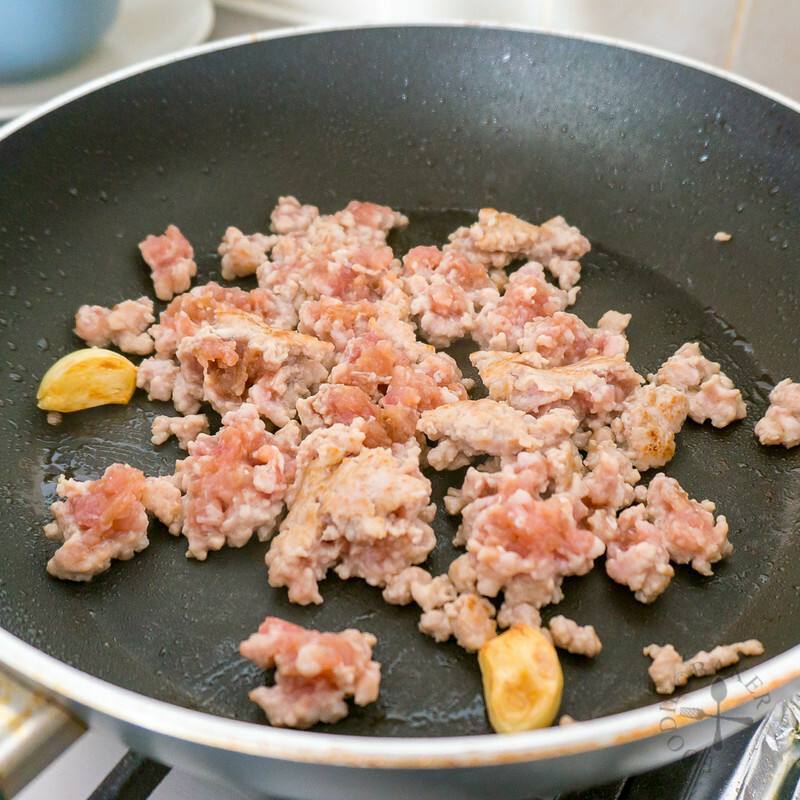 one question : how do you prep the ground pork, without the sticky raw meat smell? Hi Kaboom, the meat I usually get do not have the “porky” smell. See if you can get your butcher to grind the pork of your choice in front of you instead of buying the already-minced pork. 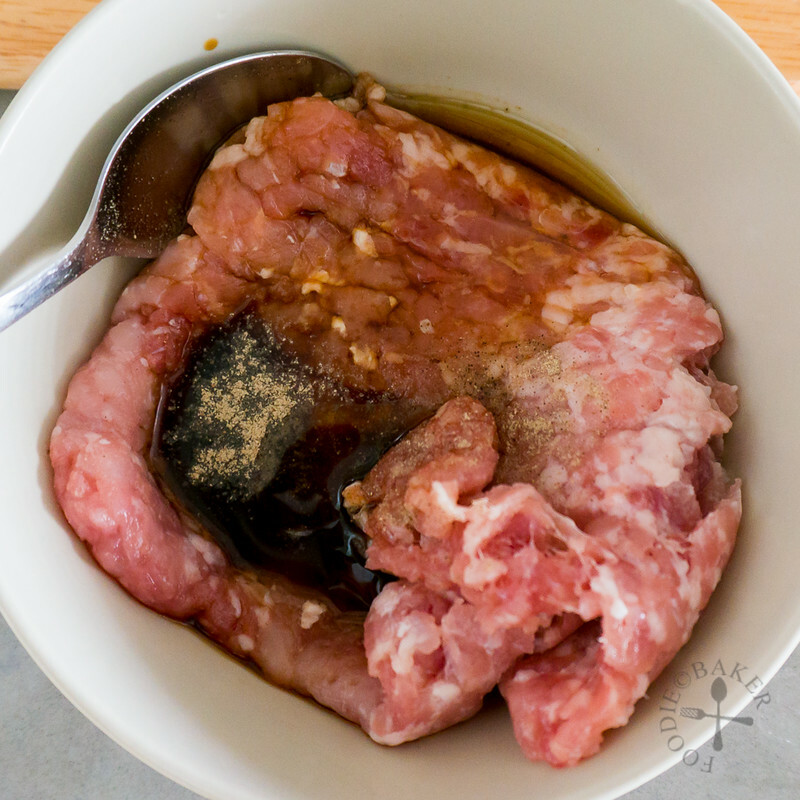 Marinating the pork will also remove some of the smell, and if you find that your pork has a very strong smell, add 1/2 tablespoon shaoxing wine or sake into the marinade. Hope this helps! Hi Jasline! I love this post and the recipe too! This dish reminds me of my primary school days when my grandma used to make this. Plus it was also one of my favourite dish to order at my canteen! Thank you for your kind sharing! Comfort food! Looks so yummy! Oh yes…i love these too…they are my fav!! That looks so good Jasline. What a comforting and delicious dish. Love potatoes.